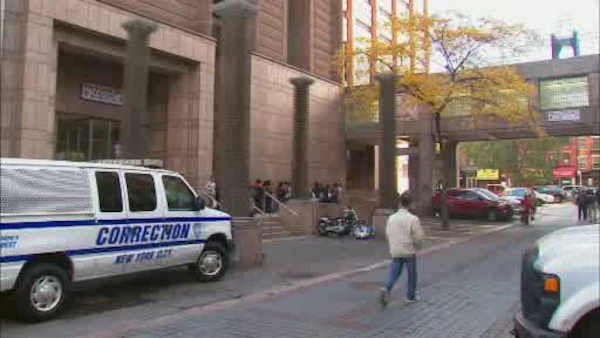 LOWER MANHATTAN (WABC) -- The Correction Officers Benevolent Association says several correction officers were injured in an altercation with a mentally ill inmate. The fight broke out Sunday morning at the Manhattan Correctional Center in Lower Manhattan and involved a deputy warden, captain and six correction officers. The president of COBA said the city's Department of Health and Mental Hygiene needs put inmates with mental health needs in different facilities. The New York Daily News reports an internal corrections department report says inmate Joseph Cannon hit Assistant Deputy Warden Arthur Ruggiero in the head in an unprovoked attack. Records shown Ruggiero remained on duty while several other officers were hospitalized. Department officials say seven other officers were taken to a hospital for pepper spray exposure. Cannon is awaiting trial on robbery and other charges.